So my friends, for some reason, I am not judging, my local grocery had to unload a lot of chickens very quickly. .68 a pound. my cooking friends, that is sixty eight cents a pound. I will bathe in chicken at that level. It comes to pass that I have a ton of chicken. Usually I would stuff it with lemons, put it in the pressure cooker. I am of course gonna get bored with that. So give me you best recipes for a whole young chicken, that has been frozen. I am right with you with a mince meat pie, already working on that. Break down the chickens for wings, thighs and breasts. That way you can make just about any chicken dish imaginable. One great whole, great roasted chicken dish is to first,Preheat oven to 375' F. then wash the chicken inside and out. Stuff the bird with aromatics, such as chopped onion, garlic, rosemary, carrots, etc. Dry the chicken outside with paper towels. season by lightly sprinkling the whole outside of the bird with onion powder, garlic powder, sage, thyme, S&P. Separate ten strips of bacon. place the chicken on a rack, inside your roasting pan. Lay the bacon from front to back on the chicken so that you completely cover the top and sides with the bacon. Insert a thermometer that can stay in the bird into the thickest part of the breast, pushing down to, but not touching the leg joint. Place the bird into the hot oven and roast without a cover for 12 minutes per pound. When the time is up, remove the bacon from the chicken skin and allow to sit in the roasting pan. Place the bird back into the oven and roast until the thermometer reads 160' F. This will give the skin time to brown and crispy up. When the bird is done, remove it, rack and all to a serving platter and let rest for ten minutes. While it rests, make gravy. Add 1/2 lb. sliced mushrooms into a heavy frying-pan with 3 tbs. butter. Stir-fry until softened. Add tree tbs. flour and stir to form a roux. Cook the roux until it turns blonde. Pour off the drippings and fond into a heavy frying pan. Slowly add chicken stock while stirring until the gravy is as thick as you want. Serve with baked sweet potato, a little honey-butter, and your favorite, leafy-green veggie. Once you have spatchcocked the chicken, season it inside and out with S&lemon-pepper, and bake or barbecue as normal. Slather with your favorite bbq sauce 5 minutes before it's done. As this chicken already tastes of lemon-pepper, might I suggest a honey-lemon sauce? Of course you can season with any sauce, or mop that your prefer. You can brine this bird as well. 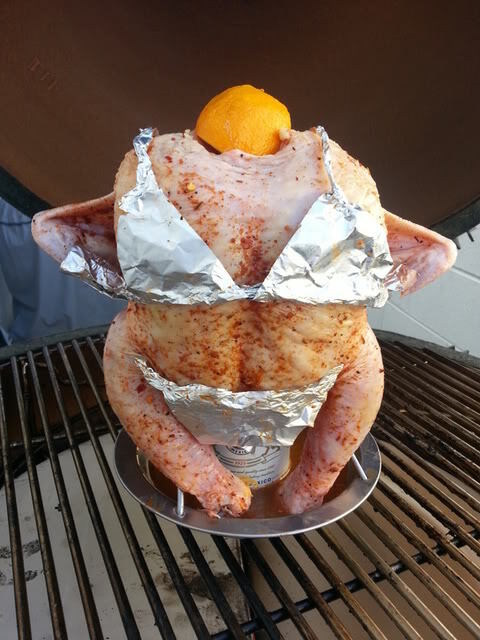 Use a turkey fryer for this one, outdoors. I have never deep fried a whole chicken. I am sure that there is someone on DC who has and can give you a great recipe, with instructions. Lardoons are pieces of pork fat, usually bacon, that are inserted into small slits in the chicken breasts, or whatever protein you are using. As the bird roasts, the fat melts and serves to both flavor and add moisture to the meat, but bastes the skin with molten fat, which helps crisp it up nicely. Simple cut bacon into small pieces. Use a pointed, thin knife (like a fillet knife) to poke slits all over the top and sides of the chicken. With a butter knife, push the pices of fat into the slits. Season with S&P, garlic, sage, and whatever suits you fancy, and roast until the meat thermometer reads 160. Remove, let rest, and serve. Whenever I carve a whole bird after cooking, I do it on a cutting board in the kitchen. I carve both breasts from the bird, and cut out the legs and wings at the body joints. I bone the thighs, remove the meat from the back, and slice the breasts accross the grain so that everyone gets some of the yummy skin. I also do that with cooked turkeys. The back meat in those little pockets at the leg and wing joints is choice. Save those for someone special. Lastly, should you decide to debone one or more of those birds, brown the carcass in the oven, then break the bones and throw them into a pot of water to cover. Add a couple carrots, cut into chunks, rough-cut onion, and a stalk of celery. Simmer for an hour or so to make a great broth for soups, sauces, and gravies. The chicken meat can be then used for anything involving chicken. Hope this gives you a couple of good ideas you can use and expand upon. I agree with the others, cut em up and toss them in the freezer! Use the trimmings to make some stock and the parts for various recipes. Save the livers to make some chopped liver spread or saute and add them to a jar of your favorite marinara sauce, serve over long pasta for a quick Spaghetti Alla Caruso. Save any of the rendered chicken fat, skimmed from the chilled stock, to use when frying potatoes. As far as the best way to cook a whole chicken I either roast them plain, on a beer can, or cover them in water and barely simmer until tender. Because I cook for one the plain chicken gives me more possibilities to use the leftovers in various dishes. If you go with the poached chicken, remove the cooked chicken from the liquid and break it down, return the bones skin, etc... to the pot and continue simmering to make a richer stock for soup. Just a few ways we have used whole and cut up chicken. One of our favorite ways to prepare whole chicken is something my husband calls chicken on the merry-go-round (rotisserie). I remove any/all giblets inside the cavity, clean the bird and pat it dry. Now it's ready for it's closeup. I loosen the breast skin and insert a sprig of fresh rosemary on each side, along with a pat of butter and a sliver of garlic. Inside, I put more rosemary, garlic and half a lemon that has been cut into about 4 pieces. If I feel like it, sometimes I'll add some small quarters of onion. Truss the bird up and give it a nice massage all over with olive oil, place on rotisserie rod and roast until golden and done. I don't remember the temp or time but, at least, the time depends on the weight of the chicken. Any cookbook should give a temperature. This produces a tasty and juicy bird and the leftovers are great by themselves or incorporated into a chicken salad, which would be great this time of the year. In warmer months, I include it in a "saucy" dish and serve over noodles or rice. Oven Roast Stuffed chicken. With stuffing or just cut up lemon and onion and some whole sprigs of fresh herbs and stuff the cavity. Fried chicken in a cast iron skillet. Make chicken gravy. Here's a fun recipe I found on the National Chicken Council website sometime ago. Based on a recipe overheard between two old ladies riding the bus. Combine marmalade, barbecue sauce, Worcestershire sauce and lemon juice, mixing well. Place chicken, skin side up, in 9 x 13 pan lined with aluminum foil. Sprinkle with salt and pepper. Pour sauce over chicken and bake 1 hour, basting occasionally. Increase temperature to 400°F. and bake 15 minutes longer. I'm very simple when it comes to chicken. I brine the whole bird, stick a lemon in the cavity, and, just like the song "Scarborough Fair" give them a good coating inside and out of parsley, sage, rosemary, and thyme. Then they go on the grill rotisserie, two at a time, until the thigh meat reads 160F. Best chicken ever.